Horde ground mount for exalted with their Argent Tournament faction (Sunreavers). Alliance version is Quel'dorei Steed. Another hawkstrider? Oh comon, there's so many already. Silvermoon rep, Magister terrace drop, pvp, silvermoon tournament. According to PTR this mount as well will cost 100 Champion Seals. May or may not be subject to change. Alliance gets a unicorn, and we get another f'ing chicken. you know what the cool thing is though? I want a Bat Flyin mount already! its long over do! no more dragons or Wind Riders. We need something different and would be? FLying Bat mOunts! Powder white(witergrasp)bat,black war(Achievement)Bat, and a brown(or bronze)argent tournament bat! that would be Sweet! For the Undead! For gods sake, quit ^&*! @ing about hawkstriders. 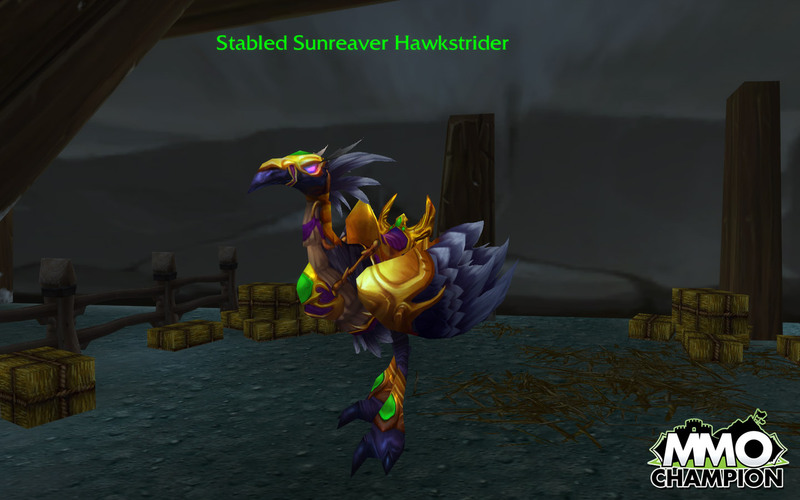 I happen to think that the sunreaver hawkstrider looks fine. And, if you examine the anatomy, it really does not resemble a chicken. Tbh for me this mount is the best in game from all the Horde factions i have all of them and after 10 seals i will have this one aswell. It's true i can't find the difference between this one and the Silvermoon Hawkstrider, they could have made it gold or with something else. i like the shade of black; its like a silvery metallic black i love it. Not one, but TWO Blood Elf characters? ...That means at least one is NOT a paladin, and that is giving you the benefit of the doubt to say that you rolled ONE belf to be a paladin because, as of now, it is the ONLY way for Horde to be Paladins. To sum up, wtf a belf that isn't a paladin and you're complaining about the damn chicken mount? You play the failrace. Get back in your hole, you get NO sympathy from me. Oh no! we get no sympathy from someone on the internet, better go jump off dalaran..
You guys can say what you want, but I happen to think this thing looks awesome. As the Blood Elf Mage that i am, OFCOURSE i want my racial mount, expecialy from the Sunreavers. The Sunreavers is a faction of blood elves who represent the Horde in Dalaran. Named after Archmage Aethas Sunreaver, the Sunreavers seek to have the blood elves admitted as members of the Kirin Tor. Unicorns are gay, you shouldn't be upset by that. I personally think the horde deserves to get an amazing mount the Alliance is not able to get, that will make them jealous. This hawkstrider has unique armor. The added flair to the wings makes it really stand out. I still get people stopping and staring at this bird. I heard it can carry two people . right? This mount does also grant the Palefroi quel'dorei for any Alliance characters you might have. This mount only costs 100 champion's seals not 150 as shown here. "Sur le terrain, une monture doit faire preuve de rapidité, d’élégance et de discipline. Celle-ci conviendra parfaitement. – Eressea Chantelaube"